Three short trails can be linked together at Wilderness State Park to make for a delightful day hike of 4 miles though a variety of terrain and natural features. The trek includes following a stream where there is a considerable amount of beaver activity, climbing to the top of Mount Nebo for a glimpse of Lake Michigan, and exploring small ponds laden with wildlife. Best of all, the main trailhead is located just a step away from the park’s two campgrounds—one situated along the sandy shore of Big Stone Bay, and the other in a grove of mature pines. Combine a night in the campground with the day hike in the morning and an afternoon spent on the bay’s beautiful beaches, and you’ve put together an enjoyable outdoor adventure for children of any age. 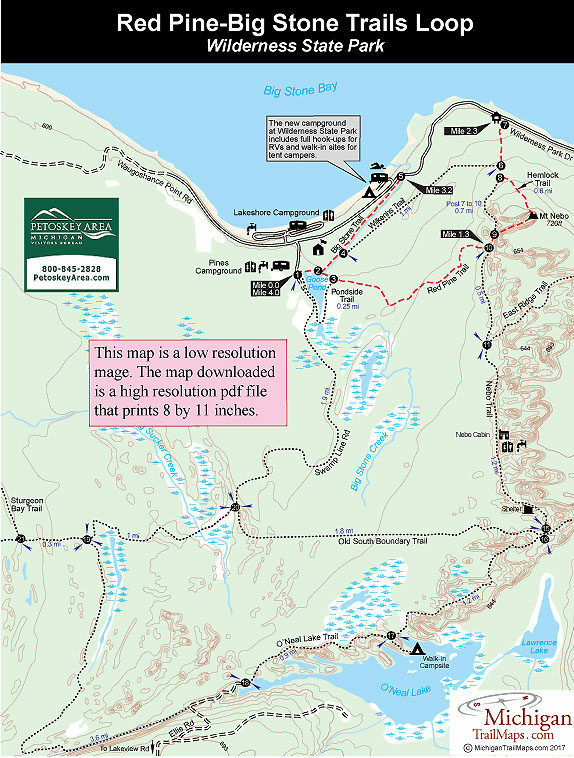 Two of the three trails—Red Pine and Hemlock—have interpretive posts, and the corresponding brochure can be obtained at the park headquarters, the contact station or downloaded from this web site. Begin at the trailhead for Pondside Trail, located a short walk from the Pines Campground entrance and marked by post No. 1. Follow the Pondside Trail east along the north end of Goose Pond to post No. 2 and then cross the bridge over Big Stone Creek to post No. 3, reached less than 300 yards from, the start. Red Pine Trail departs east at post No. 3 of Pondside Trail and immediately passes through a swamp area that is crossed by a lengthy stretch of boardwalk. In less than half mile you climb out of the lowlands and follow the crest of a low a ridge where it’s possible to gaze down on both sides. You pass two small ponds, descending to the second, larger one after first viewing it from above. Frogs will be croaking here and turtles scrambling off logs for the security of the water. If the bugs are not too bad, it’s hard not to pause in search of other critters. Beyond the second pond, the trail descends to post No. 10 at Mile 1.3, marking the junction with Nebo Trail. Just a short way north (left) up Nebo Trail is post No. 9 and one end of the 0.6-mile Hemlock Trail, a climb to the top of Mount Nebo. The first half is a steady but gradual march up the hill until you reach interpretive post No. 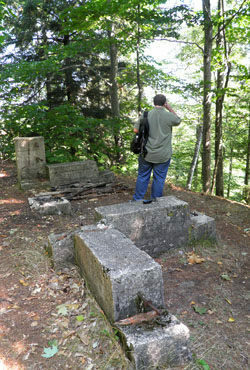 24, the high point of 720 feet where the stone foundation of an old fire tower remains. Not much of a view during the summer, but in the spring and fall you can see Lake Michigan to the north through the bare trees. The trail rapidly descends the peak and then passes some old-growth hemlock, huge trees more than 200 years old. From the north end of Hemlock Trail, it’s 0.24 mile north along Nebo Trail to it trailhead and parking area on Wilderness Park Drive. Follow the country road west (left) for almost a mile to the posted trailhead of Big Stone Creek Trail, across the parking lot from the park’s day-use area and reached at Mile 3.2. The trail is a level 0.7-mile walk that soon comes to Big Stone Creek and then follows it to where man has dammed it to create Goose Pond. In the middle of the walk you’ll see where beavers have dammed the creek themselves, causing it to flood the original trail. Today you can still see the side of the old trail in the middle of a pond. There are some great examples of gnawed trees surrounded by wood chips, and even a couple of beaver lodges, the best and largest 0.2 mile from the man-made dam. Eventually Big Stone Creek Trail merges into Pondside Trail, and it’s only a short walk west to the trailhead and display map.